Hi Greg. 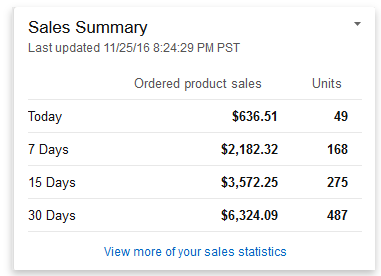 I wanted to give you an update on my progress using your system. I signed up for your program after I saw you speak during the Warrior event at the end of Sept. I felt your program was right up my ally. 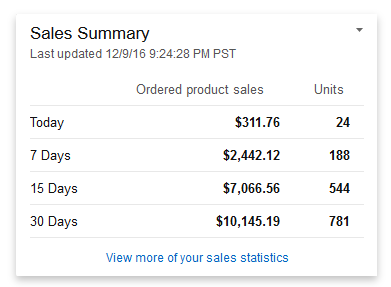 Here are my Amazon sales less than 40 days into your program. I think I found a nice niche. Im only selling an audio cd at the moment. Update, here is the new screen shot only two weeks after the first one. Greg, Thanks for a hot system. This really works! Thank you so much for your time and help today. Our session was supposed to be half an hour, but you spent almost 2 hours with me, coaching me, sharing stories, coming up with some fabulous, out of the box ideas for me to implement with my websites. You got my brain fizzing and sparking with excitement to help my husband with his local business, and to take my business to a level I had barely dreamed of. Oh, and you reminded me of the importance of dreaming too! I had been feeling so stuck, but you have lit a fire in me and I can’t wait to let you know how well we are doing after I start to implement your ideas. I encourage anyone who needs more ideas than they could possibly come up with themselves, or who needs inspiration and encouragement, to get your coaching and help, it is priceless. and so on that you provided. I will put into place immediately. I’ve always told my wife that I would love to get coaching from you. on what you taught me. I remember a lot, but I’d like to listen to the Audio to get the details. I’m like you, I love marketing, technology, and business building. the way everyone else does, I like ninja-type marketing. I meant what I said about your courses being the best that I’ve ever purchased. I see why you are soo successful, which is the same thing that my wife said. I know of no other marketer that’s soo personable with their customers and clients. Well, until we chat again… Take care.